…Okay, it was The O2 but on such a gloriously sunny day, it really did seem like we were! An Easter treat for me and the Teen, it was a perfect shared experience at an age when family days out are few and far between because friends are quite simply more fun! For starters (although it’s not relevant to me what with a 15-year-old teen who is well over a foot taller!) 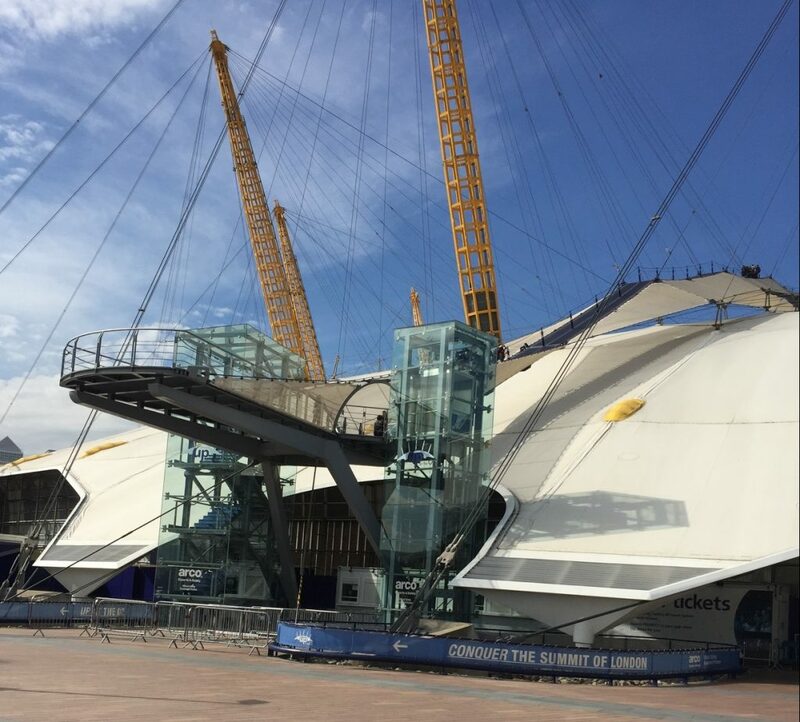 Up at the O2 have recently reviewed their age restrictions and adult:child ratio which is great news for those of you who’d like to enjoy the experience with younger kids. We went one sunny Wednesday afternoon during the Easter holidays and having checked in, met our fab guide Ross (more about him later) and watched a short film about what we were about to do, we were putting on our climbing shoes, donning our jackets, fitting our harnesses (because this is proper climbing where the harnesses make you walk like a cowboy – they were pretty tight I can tell you!) and readying ourselves for our adventure Up at the O2! Your harness with pulley-fitted is the reassuring safety mechanism that keeps you safe as you start the ascent towards the 360-viewing platform. You can stop and start as you climb, take in the views, chat to your guide and it takes about 15 – 20 mins depending on the speed of the team you are with. As someone who lives in the area and sees the iconic view of The O2 all the time, it feels quite surreal actually walking up the roof! Once you’ve finished the ascent, the viewing platform is where you get your camera or phone out and start clicking away. The panoramic view is stunning and makes you appreciate the length and breadth of the River Thames and why it’s called the Greenwich Peninsula! When it’s time to descend, the route down is steeper and quicker but all in all the whole experience takes a good 90 mins. I asked my Teen what was the best part of the whole experience and of course there was the view but he – and rightly so – paid homage to our fantastic guide Ross – who really was the star of the show. Knowledgeable, humorous, attentive, friendly and laugh-out-loud funny. He was, and I quote from the Teen; ‘..pretty inspirational and really funny!’. Suffice to say, we had a brilliant afternoon up on the roof – definitely one for the memory bank and as Ross pointed out, by walking over the roof, we got the chance to walk above the stars, stars in the form of Beyonce, Prince, Ed Sheeran and Rihanna – now there’s a thought! LittleBird Top Tip: If you have time to hang out at The O2 before or after your climb, there’s Sky Studios (where you can enjoy a virtual reality experience with a character from The Jungle Book) and the Nissan Innovation Station (full of hands on activities for kids and adults alike). You’re also only a stones throw from Greenwich Ecology Park and if you fancy spicing up your mode of transport, you could arrive by boat or leave via the Emirates Cable Car! Fancy scaling The O2 yourselves? Enjoy 10% off on LittleBird here!